Liberate your Lego for Charity! 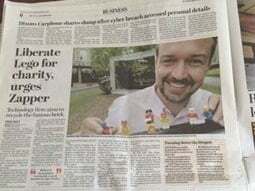 Cause UK was delighted to do a small piece of pro bono work to support a good friend who has launched an innovative recycling Lego for charity. The aim was to reach local audiences in Yorkshire, and the release achieved a fantastic spread in the Yorkshire Post!